CIRCLY 7.0 is a powerful, user-friendly, Windows-based package that automates mechanistic pavement design and analysis. Since 1987 it has formed an integral part of the Austroads Pavement Design Guide, the standard for road design in Australia and New Zealand. 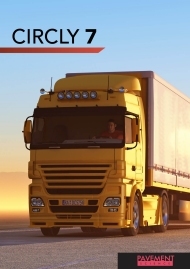 CIRCLY 7.0 implements a rigorous flexible pavement design methodology that incorporates state-of-the-art pavement material properties and performance models. It calculates the cumulative damage induced by the whole traffic spectrum. Pavement and loading databases eliminate the need to constantly re-key information. CIRCLY 7.0 is an open system that lets you define your own material properties and loadings. CIRCLY 7.0 generates graphs that show the variation of the damage factor across the pavement. CIRCLY 7.0 can also generate graphs of any component of displacement, strain or stress in two-dimensional or three-dimensional form. The Parametric Analysis feature can loop through a range of thicknesses for one or two layers, while simultaneously designing the thickness of another layer. This feature will optimise up to three layers. Combining this with a Cost Analysis feature, allows for fine-tuning of layer thicknesses to minimize construction and maintenance costs. A special design system, APSDS (Airport Pavement Structural Design System) is used for airport pavements. It is based on the CIRCLY system and has been modified to suit the design of airport pavements. We have published a paper that describes why performance data developed for highway pavements is not appropriate for heavy loadings such as airports and container terminals and can lead to grossly under-designed pavements.